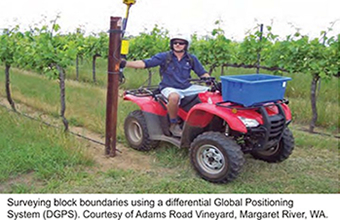 Grape growers and winemakers have known about variability and productivity across vineyards due to soil but without methods for observing or reacting to it, they have been forced to manage large blocks as if they were uniform. Precision Viticulture allows growers to quantify and react, writes Rajiv Seth. Adoption of Precision Viticulture is on the rise around the world. Following the introduction of Precision Viticulture (PV) technologies to wine industry in the late 1990s and the associated research during the intervening years, an increasing number of grape growers and wine producers are recognising the value of understanding and managing variability within their vineyards. PV is a completely different way of thinking for winemakers and viticulturalists, which allows them to control their entire harvest. It enables them to understand the relationship between their vineyard and the variables that affect it. Therefore, they are able to treat each single plot differently depending on its characteristics. Vineyard plots can be extremely variable due to soil type, topography and micro-climate. Areas may differ in vigor, nutrients, water status and quality of fruit. Precision viticulture allows for each plot to be treated separately according to its specific needs. Precision Viticulture seeks to exert more control over the production system by recognising vineyard variation and managing different areas differently. In the past, despite knowledge of variances in vineyard variability, each plot of vines was treated in exactly the same way. They would be given exactly the same amount of fertilizers, pesticides, water etc. as the next plot. In many cases this would lead to even greater differences in the vines between separate plots as some sites would not need the water, chemicals or pesticides which they had been given. Precision viticulture ensures that each individual plot is cared for in its own way and receives the required nutrient in order for it to yield the best fruit. The Green Seeker machine is a machine which is used in a similar way as a tractor and can make a map of the land which can report different levels of denseness in the vines. It uses GPS or Global Positioning System to map out the vineyard. This technology allows the winery to maximize the potential of their land and treat each plot individually. The Green Seeker is just one way in which vineyards can be mapped out. It is the most accurate way of gaining information but the most time consuming and so is used more for smaller areas. Alternative methods of mapping are by satellite and by plane/helicopter. Precision Viticulture addresses variation through the use of enabling technologies, including the global positioning system (GPS) and geographical information systems (GIS), coupled with tools for measuring and monitoring vineyards at high spatial resolution, such as remote sensing, yield monitors and high resolution soil survey. In Rioja, viticulturalists use precision viticulture to optimize the performance of their vineyards. They identify each vine with a code which looks similar to a bar code. This allows them to treat vines which have similar characteristics in similar ways, even if they are not within close proximity of each other. In addition, they use aircrafts to fly over the vineyards and take multispectral images, thus being able to detect homogeneous areas. Other equipment is used also such as DGPS Differential Global Positioning System which is connected to a pocket computer, an area computer, their own GPS and a GIS which is used to collect, store, analyze and present the data which they have collected. Using the various pieces of equipment they are able draw up maps of vigor of the vineyards as well as identify the estimation of the crop and indexes of pruning. With the various information collected they are able to ensure the different plots receive the right dose of herbicides, pesticides and fertilizers. In addition to this they can understand which plots need more or less pruning, compost and irrigation and be proactive against the control of diseases. New Worlds vineyards are vast and stretch for miles. It is apparent that there was a need for precision viticulture on an even greater scale and this is definitely what the scientists are doing. In Australia, vineyards are using highly technical irrigation system which could all be controlled from their offices. Every single vine can be given different amounts of water at different times depending on its requirements which are established through the GIS. In Spain, these practices are passed down to both the smaller wineries and used at varying degrees depending on their needs. It was intriguing to see the different levels of precision viticulture being used in practice and it is clear how the smaller wineries benefited from being part of the Codorniu group. Rajiv Seth became the first Indian in the year 1987 to receive a gold medal from wine and spirit education trust, London. Presently he is making continues efforts in educating the lab assistants of a number of wineries on procedures of micro vinification through his manuals.